Democrats outraged by billboard posted by Democrats. Party settles to blame Bush. The billboard features side-by-side pictures of the two men with the words "kills 12 in movie theater with assault rifle, everyone freaks out" over Holmes' picture, and "kills thousands with his foreign policy, wins nobel peace prize" over Obama's picture. Maurice Clements is the guy in charge the billboard. He's part of a group who honor the memory of Libertarian Ralph Smeed. He says the group is angry over Obama not bringing the troops home. "We’re all outraged over that killing in Aurora, Colo., but we’re not outraged over the boys killed in Afghanistan," Clements said. I've never understood why our team, so compassionate and loving, refuses to take credit for erasing so many human carbon footprints, and saving Gaia. Are we just being overly modest? There is no reason to have the military overseas, as long as there are, er, refractory, yes, that's it, refractory people here who just do not get how wonderful their lives would be if they succumbed to Dear Oleader. We cannot count on those people being "shot while trying to escape," which happened in the old Wild West. We have to make sure that they are rehabilitated, first at Jiffy-Lobo™ if needed, or second at the Soylent Green factory. Then on to the Soylent Green factor for what's left. 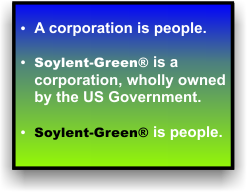 Elizabeth Warren loves Soylent Green whenever she's at the Rancho. Just can't get enough of it. She spreads it with People's Tasty Crème and washes it down with Black Putinka vodka. The good stuff. It's made from potatoes that were grown in the 21st century. KR2004, Libertarians are a very confused group, aren't they. Abstract concepts can be used to construct a tower of thought so high... that gets more and more abstract the taller it goes until, at the top, you lose sight of the original base concept the tower of thought is built on; in this instance Liberty. And so, their foreign policy and ideas about defense resemble many of the ideas that the other intellectually confused group, the Left, come up with. Comrades a self criticism session may be required lest some party members be identified in need of a constructive vacation in a re-education camp. Confusing Libertarians with Democrats is like confusing them with Republicans. To be sure we certainly could easily distinguish Left Opposition New Opposition and United Opposition Trotskyite blasphemers, but without correct committee approved education the mysteries of rightist can confuse us. Their paleo and neo schism has not yet cleaved them into mutually exclusive parties and cliques. After WWI the rightist reaction to Wilsonian Save the World Altruistic Imperialism created the America First Movement that in turn established an isolationist element of the Republican Party that survives to this day in the form of paleoconservatives like Buchannan and Paul. These 'let the Terran Socialist destroy themselves while we play golf' approach does have some merit to some thug rightist. To be sure the introduction of neoconservative refugees from the left of center, taking along their save the world imperialism (via Marines and the Peace Corps) has made for assigning tasks far beyond the design of the USAs military - and has incurred great expense. Confusion between mission and execution is rife in their ranks. Certainly there are useful idiots who will grab hold of pollyannish world views so they can focus on American Idol and other decadent American distractions. Now that you've studiously recorded these truths in your notebooks I expect you'll study them sufficiently tonight and be able to distribute this party line on the factory floors, fields and unemployment lines tomorrow. Confusing Libertarians with Democrats is like confusing them with Republicans. You can rest assured, Libertarians nearly always end up siding with RethugliKKKans (spit). Because economic factors are the most important, Libertarians prefer free-market (spit) Rs over the free-love Ds. Their perverted thinking goes like this: even if some uber-Conservative Palin/Buchannan ticket wins and, say, outlaws abortions, the citizens will still be wealthy enough to afford their and their daughters' trips to Canada, should they ever want the procedure. In Europe libertarianism was until recently mostly a synonym for anarchy. They are adopting our view. Still, some libertarians are True Progs. As for me, myself and I, I'm socially liberal and fiscally conservative. Damn it, Empress! You weren't supposed to see me type that! Empress! Empress! Quit looking at me like that. Stop it! I'll have Bruno pedicure your hooves. I will! Just back up! I promise I'll never again talk about being economically conservative. I'm a prog, and what's mine is mine and what's yours is mine if I can get it, and I intend to get it. KKKonservative Racist's Hatred is Exposed on Billboard! !